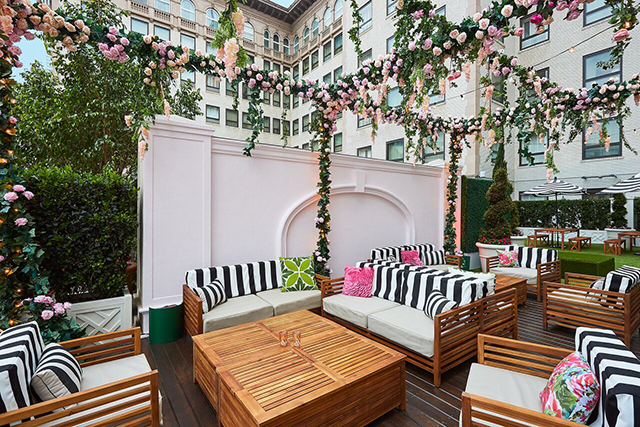 extensive variety of rosés, playful libations, and rooftop bocce and badminton on the famed Rodeo Terrace - a whimsical and elegant perch overlooking Rodeo Drive. Hidden behind the door for room 211, guests are welcomed through a pink passageway before entering the 6,000 square foot garden gambrel. Floral installations from world-renowned floral designer Eric Buterbaugh adorn the space, including a 55-foot floral wall that separates the summer eatery from the summer sports field, and a suspended floral installation that floats delicately above Carrera marble tables and woven bistro chairs. Nearby community farm tables sit atop the grassy rooftop, surrounded by acacia wood lounge furniture and uninterrupted views of Rodeo Drive. Adjacent to the café, rooftop bocce and badminton hover high above Beverly Hills. Rosé Sundae with Rosé Sherbet, Tahitian Vanilla Bean Meringue Kisses, Almond Marshmallows, Raspberry Rosé Gummies, finished with 23k Gold in a Sparkling Rosé Float. 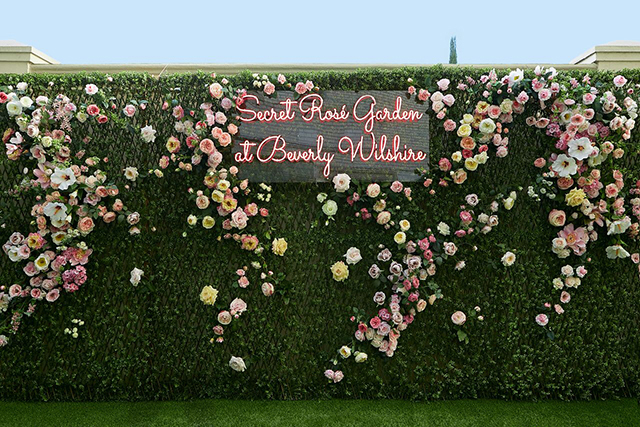 Open daily to both locals and hotel guests alike, The Secret Rosé Garden is available from 3 p.m. – 10 p.m. through September 3, 2018. Select seating is available on a first come, first serve basis. Reserved seating is available for a maximum of 2 hours for $100-$350, and includes a variety of complimentary items such as rosé popsicles.